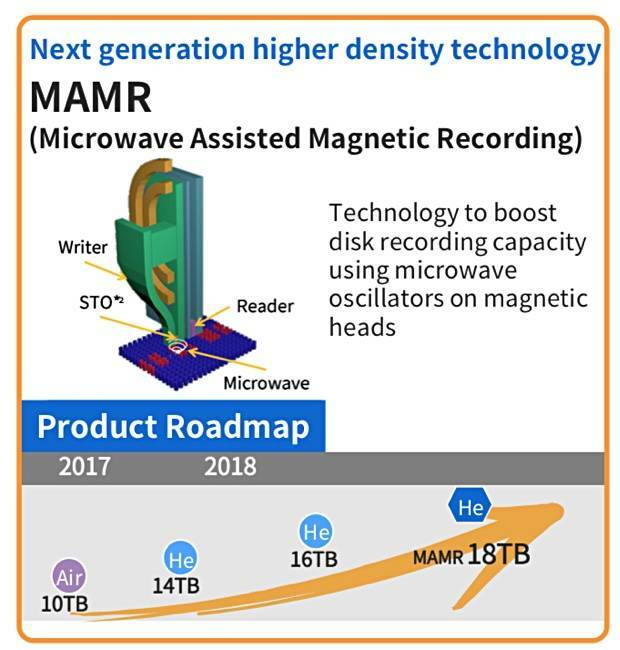 Toshiba, like Western Digital, is going to use Microwave-Assisted Magnetic Recording (MAMR) to escape the inability of current PMR tech to go beyond 15-16TB disk drive capacity. Up to now we haven't known what Toshiba planned to do to increase disk capacity in the future. PMR (Perpendicular Magnetic Recording) can be roughly thought of as groups of upright rods of magnetism in a magnetic recording medium layer, arranged in circular tracks around a disk platter. Each rod forms a bit. The end of the rod is what is magnetised by a disk's read:write head and the smaller this end area is, the less stable the applied magnetic polarity. As the bit area shrinks, the magnetic value can be altered by temperature changes or the value of neighbouring bits, rendering the disk useless. The remedy is to use a more stable recording medium, one with a higher resistance to magnetic polarity changes, known as a high coercivity. But that coercivity has to be overcome in order for a read:write head to change the magnetic polarity. Seagate has chosen to do thus using heat (Heat-Assisted Magnetic Recording or HAMR). Proponents of the MAMR approach say HAMR stresses the disk surface and read:write heads rendering the disk unreliable in the long-term. Seagate disputes this and has demonstrated long life HAMR read:write heads. Western Digital has chosen MAMR for its future technology and now we know Toshiba is doing the same. Dr Shiro Saito, a Toshiba corporate EVP, gave a presentation on Toshiba's technology strategy on November 22 and we have seen a copy of his slide deck. The read:write head has an added Spin Torque Oscillator (STO) which produces microwave radiation. Microwave electro-magnetic radiation has frequencies and wavelengths between 1mm and 1m, and frequencies between 300GHz (1mm wave length) and 300MHz (1m). Microwave ovens use a 2.45GHz frequency or thereabouts and the microwave energy is absorbed by the water content in food, so heating it. It is reckoned that MAMR could lead to 4Tbit/in2 areal densities, beyond the 700 to 1,000Gbit/in2 used currently, and leading to 40TB drives.